The name of this program pretty much describes what the application does, but apart from that, it also includes several useful additions which many may find helpful. This app allows you to record music which is currently playing on your computer and virtually everything that you hear from your PC speakers. This includes instant messaging/Skype conversions, video chats and video games you're playing. Under the application settings, you can select which audio device you would prefer to use. Version 14.8.1 is a freeware program which does not have restrictions and it's free so it doesn't cost anything. 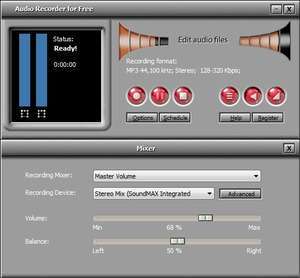 For security reasons, you should also check out the Audio Recorder for Free download at LO4D.com which includes virus and malware tests. Additional screenshots of this application download may be available, too.